The Kid Kusion company was started in 1991 out of the owner's necessity to protect their young son from the raised fireplace hearth in their home. The original Kid Kusion Fireplace Bumper Pad is still sold today! They have added many products since 1991 to keep their babies safe, as well as yours! Every item is developed and tested by moms and dads just like you. The Kid Kusion Kid Safe Retractable Driveway Guard creates a safe play area in your driveway. The Kid Kusion Kid Safe Driveway Guard is a retractable safety net. 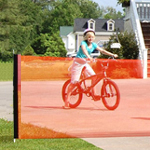 The Kid Safe Driveway Guard is highly visible, bright orange netting that clearly sets boundaries for drivers and kids. Available in ither 25 or 18 foot lengths.